Middle Township's Maddie Barber (center) has been named a Maverik National High School Lacrosse All-American. Middle Township’s Maddie Barber (center) has been named a Maverik National High School Lacrosse All-American. Maddie Barber, a rising junior at Middle Township High School, has been named a 2018 Maverik National High School Lacrosse All-American and has been selected to attend the Maverik National Lacrosse Classic scheduled for early next week in Frederica, Del. The Maverik National Lacrosse Classic was created to provide lacrosse athletes with a competitive venue to display their athletic skills, qualify for selection to represent their state in a national tournament and gain recognition by competing in front of NCAA lacrosse coaches of all levels. Barber is considered one of the top young talents in New Jersey high school girls lacrosse. Barber has posted 112 goals and 148 assists through her first two high school seasons for Middle. As a sophomore in 2018, she scored 66 goals and passed out a state-best 109 assists. She was named a first team Cape-Atlantic League all-star at midfielder. 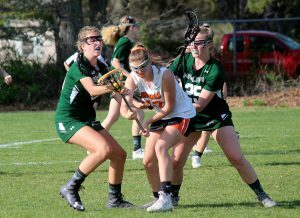 Barber also plays lacrosse for the SouthShore 2020 club team and last winter was a starter for Middle Township’s varsity girls basketball team. Barber also carries a 4.43 grade point average, is a class representative in student government and is a member of the Key Club.